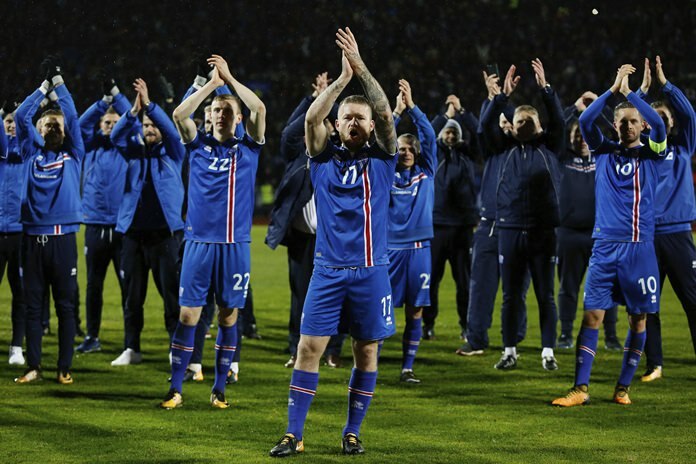 Madrid (AP) — The Icelandic thunderclap is making its way to Russia. Iceland added to their incredible European Championship campaign by becoming the smallest nation ever to qualify for the World Cup on Monday. That means the Viking chant popularized by Iceland fans at Euro 2016 will be heard across Russia next year. The chant was a success when Iceland made their major tournament debut at the Euros in France last year, where they stunned everyone by reaching the quarterfinals after drawing with Cristiano Ronaldo’s Portugal in the group stage and eliminating England in the last 16. Ireland secured a playoff spot from Group D, while Gareth Bale’s Wales were eliminated only 15 months after reaching the semifinals at Euro 2016. Spain and Italy won their last qualifying games in Group G, which had already been won by the Spaniards. Italy were already assured of a playoff spot. Serbia qualified for the World Cup for the first time since 2010 by beating Georgia 1-0 in Belgrade with a goal by Aleksandar Prijovic’s in the 74th minute. The result left Wales and Ireland to decide their fate in the Celtic showdown in Cardiff, and the Irish got the victory and a playoff berth after James McClean’s 57th-minute goal following a defensive mix-up by the Welsh. Bale couldn’t play for Wales because of injury. Spain ended their qualifying campaign by beating Israel 1-0 in Jerusalem, while Italy scraped past Albania 1-0 in Shkoder in another poor effort which will do little to inspire confidence in coach Gian Piero Ventura and his team. “We have some limitations at the moment but today there was the desire to try and do things,” Ventura said. With a World Cup berth already secured, Spain played without most of their regular starters in Jerusalem but won thanks to a long-range strike by Asier Illarramendi in the second half. They finished unbeaten with nine wins and a 1-1 draw against Italy in Turin last year. The Italians ended five points behind Spain. Liechtenstein were outscored 39-1 in their 10 qualifiers. Iceland made history by beating last-place Kosovo with a goal by Gylfi Sigurdsson in the first half and another by Johann Gudmundsson in the second, keeping the momentum from their inspiring run at Euro 2016. The result left the Icelanders two points in front of Croatia, who beat Ukraine 2-0 in Kiev to secure the playoff spot. Kosovo completed their maiden qualifying campaign for a major tournament with a single point from a draw at Finland. Iceland, unbeaten in 13 competitive home games, will be the smallest nation in terms of population to play in soccer’s showcase event.